In recent weeks on Facebook, Joelle has been providing a pleasurable counterforce to a stream of news liable to provoke dread, despair, or rage: a counterstream of reproductions of art works in various media and genres, some of them familiar (Manet’s Olympia came past a little while ago), many by artist X before X became X (before X developed the recognizable style X is famous for), many that are simply little-known works by well-known artists, and many from artists you’ve probably never even heard of. Delightful. Two of the artists — Franz Marc and Odilon Redon — are old favorites of mine. And a third, the currently very visible glass sculptor Dale Chihuly, appears here through a sliver of connection to Redon. 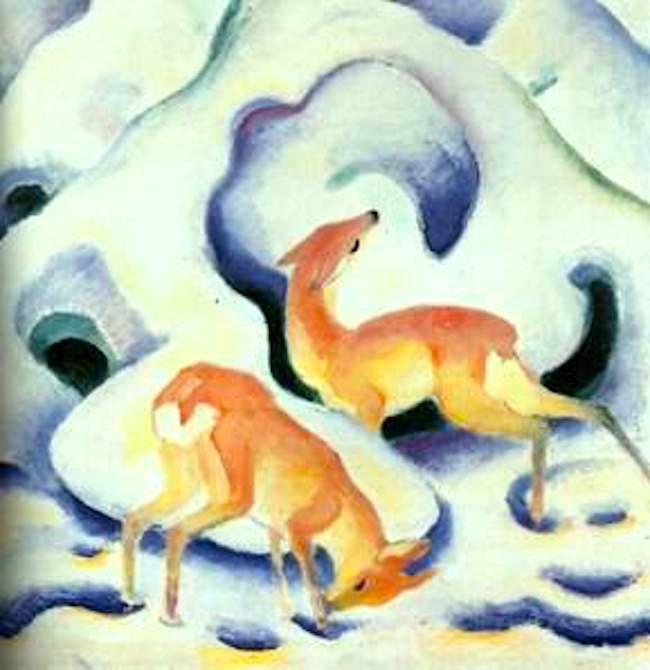 Franz Marc (February 8, 1880 – March 4, 1916) was a German painter and printmaker, one of the key figures of German Expressionism. He was a founding member of Der Blaue Reiter (The Blue Rider), a journal whose name later became synonymous with the circle of artists collaborating in it. I came across Marc as an undergraduate at Princeton, when he appeared as part of the artistic world surrounding writers whose works I was reading in a German class. On this blog, see my 10/8/11 posting “Blue horses”, about Marc and his horse paintings. 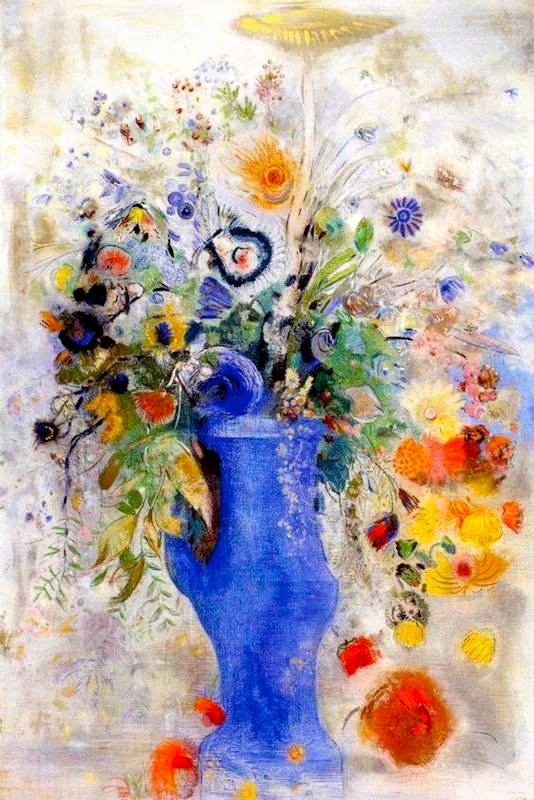 An enormous number of these flower paintings can be viewed on the net; I spent several hours lost in Redon’s flower world while preparing this posting. 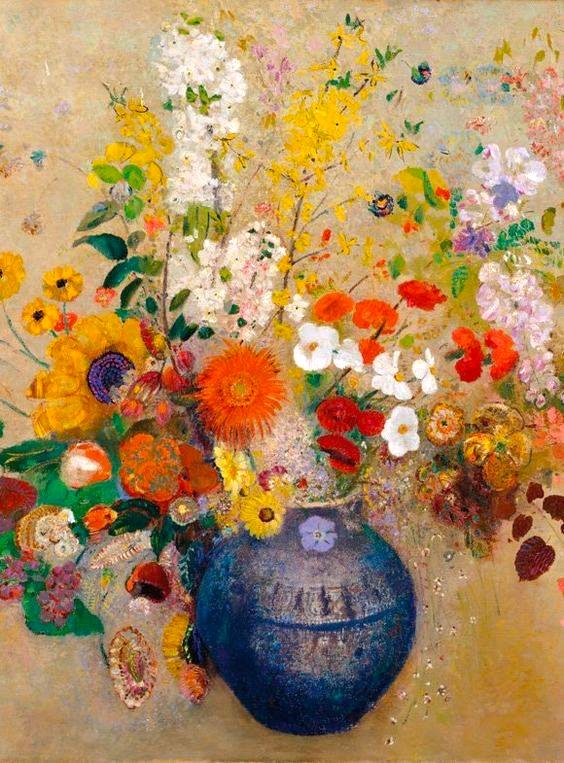 Odilon Redon (born Bertrand Redon; April 20, 1840 – July 6, 1916) was a French symbolist painter, printmaker, draughtsman and pastellist. … The young Bertrand Redon acquired the nickname “Odilon” from his mother, Odile. … At the end of the [Franco-Prussian War], he moved to Paris and resumed working almost exclusively in charcoal and lithography. He called his visionary works, conceived in shades of black, his noirs. … In the 1890s pastel and oils became his favored media; he produced no more noirs after 1900. … Baron Robert de Domecy (1867–1946) commissioned the artist in 1899 to create 17 decorative panels for the dining room of the Château de Domecy-sur-le-Vault near Sermizelles in Burgundy. Redon had created large decorative works for private residences in the past, but his compositions for the château de Domecy in 1900–1901 were his most radical compositions to that point and mark the transition from ornamental to abstract painting. The landscape details do not show a specific place or space. Only details of trees, twigs with leaves, and budding flowers in an endless horizon can be seen. The colours used are mostly yellow, grey, brown and light blue. noun ikebana: the art of Japanese flower arrangement, with formal display according to strict rules. ORIGIN Japanese, literally ‘living flowers’, from ikeru ‘keep alive’ + hana ‘flower’. 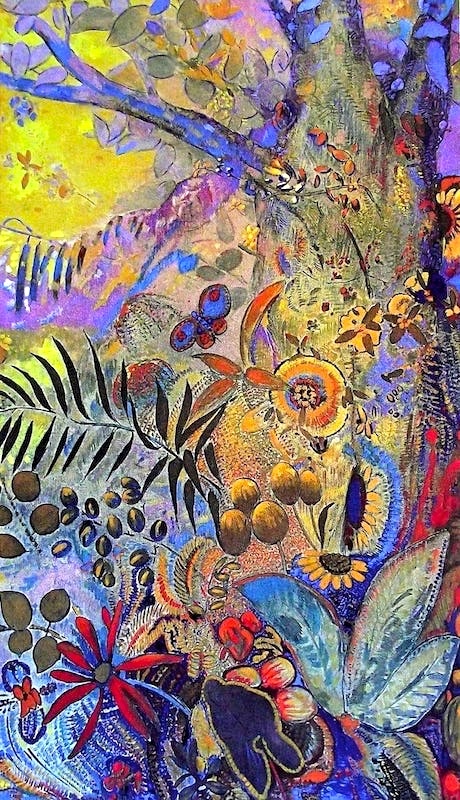 I saw #6 as Chihuly in an Odilon Redon mood — the Japonisme, and the colors Redon favored in his flower paintings. 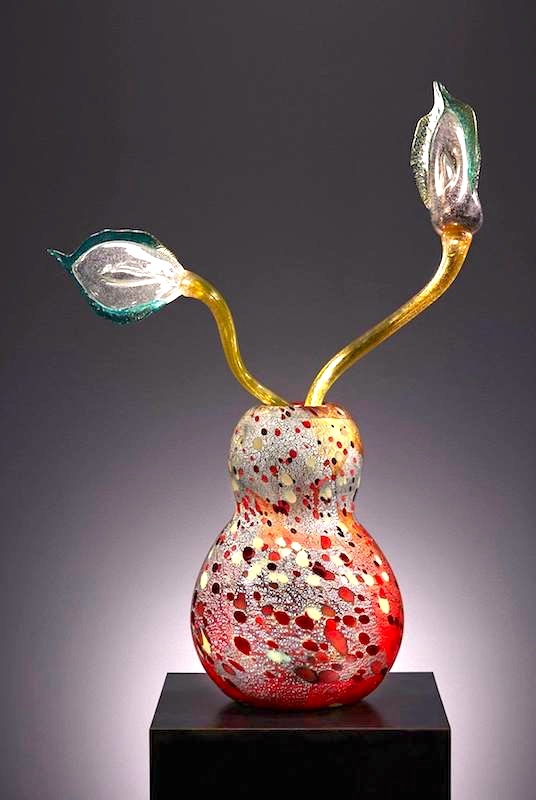 Dale Chihuly (born September 20, 1941) is an American glass sculptor and entrepreneur. His works are considered to possess outstanding artistic merit in the field of blown glass, “moving it into the realm of large-scale sculpture.” The technical difficulties of working with glass forms are considerable, yet Chihuly uses it as the primary medium for installations and environmental artwork. His creations are mostly gigantic, suspended in mid-air, intensely colored, and incredibly showy. I first experienced them at the Columbus Museum of Art, thanks to a boyfriend who was a great fan of Chihuly’s work. Since then, I have seen his work in installations all over the place here in California (at Stanford, in San Jose, and in San Francisco). This entry was posted on December 12, 2018 at 10:01 pm and is filed under Art, Language and plants. You can follow any responses to this entry through the RSS 2.0 feed. You can leave a response, or trackback from your own site. If you’re interested in seeing Chihuly’s work in his home base next time you’re up this way, there’s the Museum of Glass in Tacoma and the Chihuly Garden and Glass at the foot of the Space Needle.